The first time my Vagabond Soldier deployed to Afghanistan, resources about the country were hard to find, out of date, and seemed to reveal little about the true spirit and culture of the Afghan people. Even though my son was a baby at the time, I wanted to find stories to share with him that would help us both develop an understanding of the culture and values of the Afghan people with whom my husband would end up spending so much of his time (though, when that first deployment began, I had no way of knowing just how much of our family’s next decade would be invested in Afghanistan). Although the last ten years have given rise to a broad and deep collection of literature and resources about Afghanistan, its history, and its people’s varied and rich culture, it remains a challenge to find politically unbiased and informative resources appropriate for children. In this blog post, I am sharing resources from two of my library science courses–one is a resource we explored that will connect you with stories from around the world, and one is a resource I created in an effort to collect reliable information to share with my son to gain a better understanding of Afghanistan. The first is a wonderful site called the International Children’s Digital Library, whose mission “is to support the world’s children in becoming effective members of the global community — who exhibit tolerance and respect for diverse cultures, languages and ideas — by making the best in children’s literature available online free of charge.” I have included links to, and a brief description of, two Afghan stories from the ICDL site below. The second resource is a Pathfinder (resource guide, available by clicking the link provided) I created that contains information about a variety of stories, blogs, recipes, videos, music, and other resources to explore with your children in elementary and middle school to learn more about Afghanistan–whether for a school project or to prepare for a deployment. I hope these resources help you connect with this country and culture that holds a special place in my heart. Written by Idries Shah and illustrated by Rose Mary Santiago. Hoopoe Books, ISHK. Available on ICDL (click title above) in English, Spanish, Dari, and Pashto. Audio available in English and Spanish. Idries Shah shares this tale that has been passed for years in the oral tradition in Afghanistan in Dari and Pashto. This tale is the story of a young boy who visits another village and finds the people there terrified of a dangerous animal the likes of which they had never seen before. Through bravery, and a willingness to share knowledge and understanding, the boy helps the village people overcome their fears and discover something new and wonderful. Written by Idries Shaw and Illustrated by Ingrid Rodriguez. Hoopoe Books, ISHK. Available on ICDL (click title above) in English, Spanish, Dari, and Pashto. Audio available in English and Spanish. Idries Shah shares one version of this tale that was originally told by 13th century Sufi poet Jalaluddin Rumi and has been passed down in oral storytelling tradition in Afghanistan in Dari and Pashto. This is the tale of a kind and happy lion who faces a frightening surprise when he goes to the reflection pool for a drink of water and learns that things may not always be what they appear. 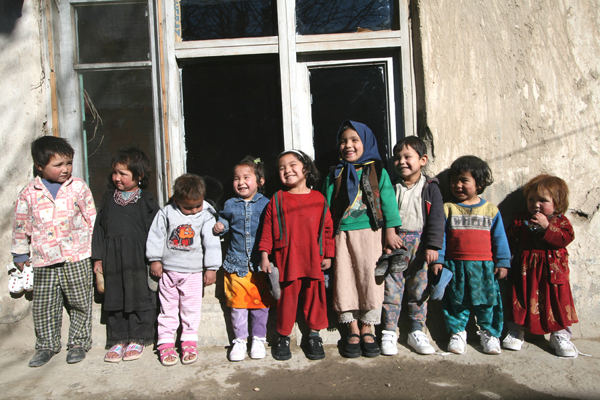 This guide will help parents and teachers find current, quality resources to use with children from 3rd to 8th grade to enhance their cultural understanding of the people of Afghanistan and to learn more about the country of Afghanistan. I think it is wonderful that you made your family’s military experience a tremendous learning opportunity for your son. In the spirit of a true librarian, you have provided readers with a rich compilation of resources for gaining a better understanding of Afghanistan. Thank you!